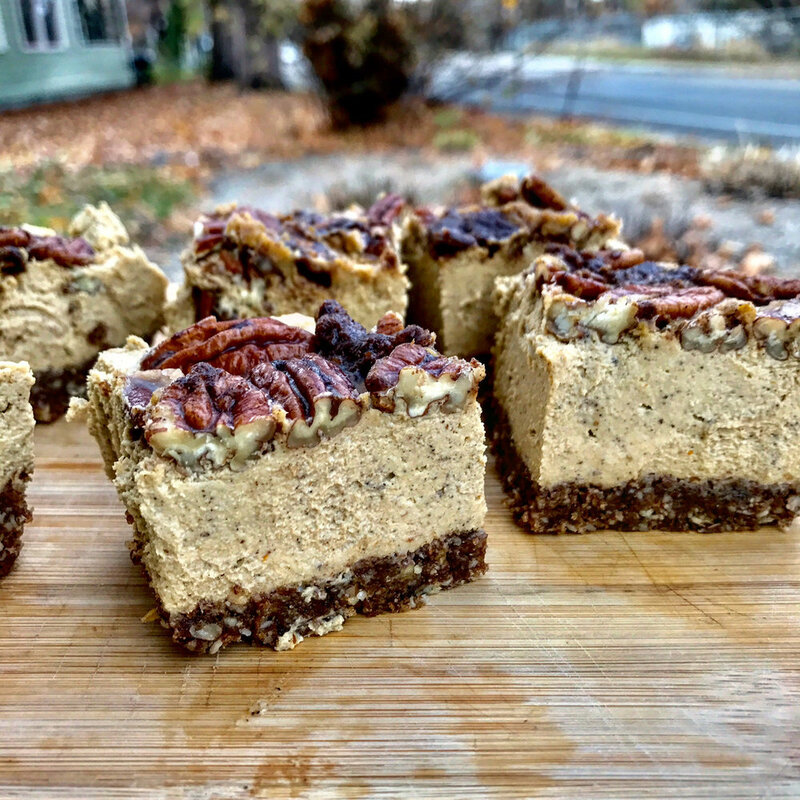 This is basically the same exact recipe as my previous fermented cashew cheesecake just with a little pumpkin flare. You can refer to that recipe for more detailed instructions, but I'll just put the recipe for the pumpkin cheesecake here! This is the ultimate thanksgiving dessert. Your family will love it and rather then wanting to take a nap right afterward it will leave them feeling energized and satisfied! Serve it as a whole cheesecake or you can cut it into little cheesecake squares (as pictured above). Have leftovers? No shame in enjoying a slice for breakfast! 1. First, blend the pecans in a high speed blender until it comes to a flour like consistency. Then add the remaining ingredients. Once all of the ingredients are incorporated into a crumbly mixture, transfer to a 9 inch pie pan. Flatten the mixture out using your hands, use the back of a spoon to flatten out the edges. Place in freezer. 2. Rinse blender and then add all of the ingredients for the filling. Blend until smooth and then transfer into the pie pan evenly. Let sit in freezer for 2 hours. 3. Remove from the pie pan (use a knife to cut along the edges to loosen it up) it should just pop out after that if you flip it over. 4. For the cinnamon caramel pecan topping, heat the coconut oil, maple syrup and coconut sugar in a skillet over medium low heat. Add in the pecans and cinnamon until thoroughly combined (should turn out like a sticky crumble). 5. Top the cheesecake with the topping and store in the fridge for up to 7 days.